While you’re running around taking silly photos with your smartphone of what you ate for lunch today, a researcher at the University of California, Los Angeles, has found a way to photograph microscopic cell samples using a cell phone camera. Dr. Aydogan Ozcan, a professor and head of the Ozcan Research Group at UCLA, and his team of electrical scientists and bioengineers have developed a device that fits onto any camera-equipped cell phone that could benefit doctors and scientists in countries with limited clinical supplies. The research findings were recently published in the Journal of Visualized Experiments (JoVE, subscription required). Fluorescent microscopes and flow cytometers are tools often used in research and diagnosis, with scientists using flow cytometers to count and characterize cells in a liquid sample (commonly used in molecular biology, pathology, and immunology). But the instruments are bulky and costly, rendering them unattainable and ineffective in resource-limited scenarios. 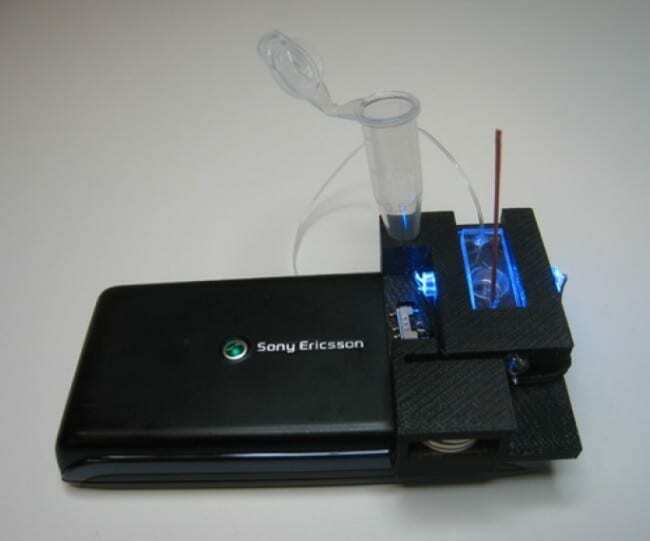 With a cell phone, the researchers have integrated wide-field fluorescent microscopy and imaging flow cytometry tools using “compact, lightweight, and cost effective opto-fluidic attachments.” The device’s capabilities will “make it possible for areas with limited resources to easily run tests such as checking for contaminated water and monitoring for HIV-positive patients,” according to the research statement. The device will work with any phone that has a camera, not just modern smartphones (as demonstrated by the candy-bar Sony Ericsson in the images). “A cell phone has almost the computing power of a super computer of the early 1990s, and with over 6 billion cellphone subscribers in the world there is a massive cost reduction to owning a cellphone. That is exactly why I and my colleagues are trying to deploy these micro-devices to cellphones,” said Dr. Ozcan.